An afternoon of Classical Music presented by Peter Jones and performed by a number of our regular St George’s recitalists. There is a booking fee of £2 per transaction plus £0.50 per ticket for all purchases made on-line. Limit of 8 tickets per transaction. THE HAMMIG STRING QUARTET was formed in 1989, taking its name from the violin-maker Wilhelm Hammig (1838-1925). Over the years the quartet has given many recitals across England and Wales and has made several visits to Leichlingen, Germany. They are frequent performers at St George’s, Beckenham in both the Friday lunchtime and Saturday morning Coffee Concert series, and for other special events and services. Recital venues have included Concord College Shropshire, the Usher Art Gallery Lincoln, the Atheaneum Bury St Edmunds, St Anne and St Agnes Gresham Street, St Alfege Greenwich, St Mary’s Balham, St Katherine’s Knockholt and the River and Rowing Museum Henley on Thames. They played at Penn House Amersham for the National Society for Epilepsy, and performed as part of the ‘Rochester 1400’ celebrations. Since 2005 they have participated in annual fundraising Celebrity Christmas Carol Concerts for the Cystic Fibrosis Trust at Odiham, and for some years gave fundraising recitals for the Beckenham and Borders branch of the National Childbirth Trust. They have played at St Martin in the Fields with the Bromley Boy Singers in their New Year’s concert, and in several concerts for the South London Singers and Wareham Choral Society. In February 2010 they were invited to join Keziah Thomas for a joint quartet and harp concert in aid of the Romanian Aid Foundation. In May 2011 they played Shostakovich’s 8th quartet in a lecture recital given by Anna Davis at the St George’s Arts Festival. 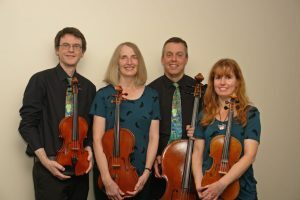 More recently the quartet has given recitals at the Colour House Theatre at Merton Abbey Mills, St Mary’s Bromley, St Nicholas Brighton, St Leonard’s Seaford, St Matthews Westminster, and Purley United Reformed Church. In February 2014 they played at the Mansion House for the Gardeners Livery Company Banquet, in the presence of Prince Edward, and again in 2015. They were honoured to be the inaugural artists in residence at St John’s Catford for the season 2017-18. Following the death in 2013 of their friend and colleague of more than twenty years, Paul Collen, they explored the string trio repertoire for a few years as well as performing piano quartets with Clare Wibberley, and oboe and cor anglais quartets with Caroline Marwood. In September 2017 they were delighted to welcome Sarah Colley as their new permanent violinist. Clare Morgan started piano lessons at the age of 5 and at age 13 became a Junior Exhibitioner at the Royal Academy of Music. She continued there as a full-time student on leaving school and since then has combined piano playing with administrative posts within musical organisations, as well as some instrumental teaching. She is a member of St George’s choir.